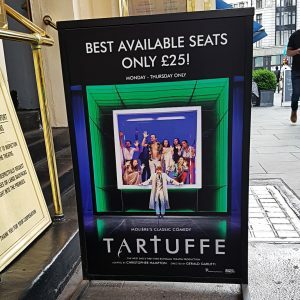 Touted as the first bi-lingual play in the West End, I just had to check out Tartuffe at the Royal Haymarket Theatre. 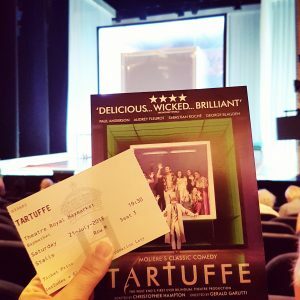 Based on Moliere’s classic, this version of Tartuffe is catapulted into modern times Los Angeles, where the wealthy Orson is completely enamoured by the charms of the radical evangelist Tartuffe. While Orson’s family struggles to prove that Tartuffe is nothing but a charlatan, he hatches his own plans. While this modernisation is really well done, I feel the stage design hinders the development of the play a little too much. While the stunning glass box in the background seemed impressive and interesting at first, it ended up muffling people’s voices (you’d think they’d use microphones to counterbalance this, why on earth they didn’t is absolutely beyond me), disrupting scenes as a physical barrier that put more distance between the actors than the scene would have called for, and generally just disturbing the flow with the weird noises it made when extending or retracting. As beautiful as it was, it wasn’t practical and didn’t suit the action of the play in any way. The bilingual approach was very interesting, I really liked the idea and brought a native French speaker along with me. With several sub- and surtitle screens strewn throughout the theatre, none of them seemed to be in a position that would allow you to read the dialogue while still watching the action. Translation were provided for whichever language was currently spoken, so during French dialogue the screens showed English translations, for the English spoken parts, they gave the French counterpart. 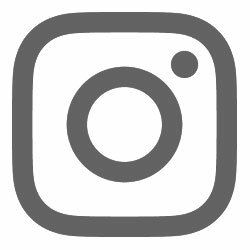 What was very obvious to me, even with very limited understanding of the language, was that the original French was much more lyrical, rhyming and flowing significantly better than the English translation. They could have made the effort to make the English parts just as lyrical, the way it was it just seemed a bit too mundane and stark in contrast. Some scenes had rapid switches between the two languages, which is difficult to keep track of, even for bilingual people. 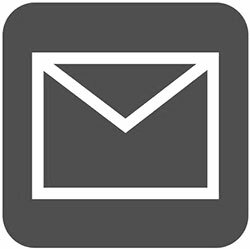 However, I liked the approach and as a bilingual person myself, it really reflected the confusion and struggle you experience when you rapidly switch languages in a single conversation, which was a nice touch that I doubt would be picked up by monolingual speakers though. I generally liked this production and though some of the acting was great, but the set just didn’t work with it and the lack or lyrical rhyming in the English part annoyed me a little. Four out of six rainbow sloths from me.